Check out the new updates for free. Tripwire's Killing Floor 2 and Rising Storm 2: Vietnam are both getting their first major updates of 2019 today, and anyone can check them out on Steam this week. Both games will be free to try from 10 am PT today until 10 am PT on Friday, and both series will be on sale for the duration. 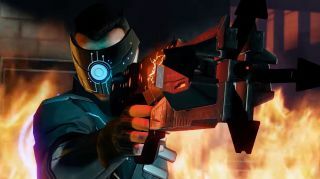 Killing Floor 2: Cyber Revolt decks the zed-murdering multiplayer romp in neon lights and transforms players into street samurai and cyberpunks. The update throws a new map, Spillway, into the mix, and players will get to muck around with two new weapons: the Killerwatt and the Helios Rifle. Expect new music, enhancements, achievements and cosmetics. Take a look at the Killing Floor 2: Cyber Revolt trailer below. Over in Rising Storm 2: Vietnam, two reimagined Red Orchestra 2 maps are being introduced, along with a community-made map that's been polished and made official. Apache Snow, DMZ and Saigon can all be fought over from today. Keep an eye out for them shedding their price later today.